Above all, I learned what government of the people, by the people and for the people really means. We are the government, and the government is not our enemy. Barbara Jordan — attorney, former congresswoman and professor at the LBJ School of Public Affairs — would have turned 76 today. At the age of 59, her candle burned out too soon. She helped unify this nation, and we need her now more than ever. When she was sworn into office as U.S. representative in 1973, the Congress had about a 40 percent approval rating. Gradually the body has become fully polarized. With approval ratings of 10 percent, Americans were amazed last week when the Congress functioned enough to pass needed legislation extending payroll tax cuts. During the Republican presidential primaries, we’re not hearing words to reaffirm our shared values and try to unite us. Instead, the flames of the most disgruntled among us are being fanned. The chair of the Federal Reserve is treasonous; the president’s Christianity is not real; the government is waging war on religion; we should wage war on Iran; the free press is evil; Planned Parenthood and the U.S.-Mexico border should be shut down. The essential message is that government is the enemy. Divided we stand. The most radical candidate will become the party’s nominee, driving the wedge down deeper into the body politic. Yes, we need Barbara Jordan back now to unify this nation once again, like she did 38 years ago. In 1972, President Richard Nixon was running for re-election against Sen. George McGovern. His campaign committee paid five men to break into the Democratic headquarters in the Watergate Hotel in Washington, D.C. (Pretty unnecessary — Nixon’s victory was one of the most lopsided in history.) The men were caught. Washington Post reporters Bob Woodward and Carl Bernstein uncovered the cover-up, and all the president’s men (the five burglars and two others) were convicted in 1973. The ordeal rocked the political world. Hearings were called to consider whether to impeach the president. 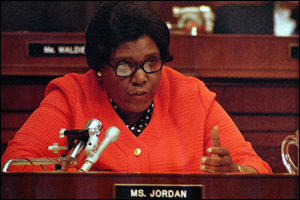 Jordan served on the House Judiciary Committee. Americans were glued to their televisions. On July 25, 1974, a 38-year-old, relatively unknown black representative in her second year in Congress delivered the opening statement to begin the hearings. In 15 minutes, Jordan electrified and focused a nation in turmoil. She united us and changed the course of history. Fearing impeachment or removal from office, Nixon resigned from the presidency two weeks later. In 1992, the gods smiled upon me, and by some accident of fate, I was allowed into Jordan’s policy seminar at the University of Texas’ LBJ School of Public Affairs. A nursing graduate student, I was out of place among 10 confident political science graduate students, selected for their accomplishments. I was old enough to be their mom, and the only knowledge I had of government, beyond the basics, was from a UT government class that I slept through in 1965. I’ll never forget how I felt when I actually saw her in person. Chills went down my spine when I heard her first words. Her voice rang from the mountaintop. She assigned readings by the most respected authors on basic democratic principles, the Constitution and topics of national debate. We each argued a side and respected each other’s informed opinion. Riding the fence was unacceptable. She gave us each a little blue handbook of the Constitution. I absorbed the conviction that public service is a high and honorable calling. I learned that the Constitution is a purposely vague and sacred document that forged a government in which our liberty was not entrusted to a particular branch, that one branch would check the others. I learned that in America’s great experiment in democracy, the people hold the power, and rightly so. As we remember Barbara Jordan. On this day, we need to reflect on her clarity of thought, her voice, her message of unity.